August 3, 2018 – Grant applications posted to CCAA website. October 1, 2018 – All CAD grant applications received (not postmarked) in the CCAA Office by noon. October 13, 2018 – CCAA Grant Committee meets to review the CAD applications. November 2, 2018 – All AIE grant applications due in the CCAA office by noon. November 5, 2018 – CCAA Board reviews/approves recommendations of Grant Committee. November 6, 2018 – Notification letters and Grant Agreements sent out to all AIE and CAD grant recipients. November 13, 2018 – Deadline for all grant recipients to return signed Grant Agreements. 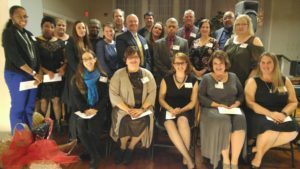 November 17, 2018 – CCAA Grantees awarded grant checks at the CCAA Annual Grantee and Membership Gala. 21 Days Following Completion of the Project – Final Grant Reports due from all CCAA grantees. Congratulations to the FY 2019 CCAA Grant Recipients!